Del Webb Wilmington is a new 55+ community in Wilmington, North Carolina. This active adult neighborhood is part of the RiverLights master-planned community and will consist of 547 single-family homes upon completion. This is Del Webb's first age-restricted development in Wilmington and features an active and social lifestyle as well as provides a convenient location that's close to the Cape Fear River and North Carolina beaches. Amenities include a 15,000 square-foot clubhouse that is the central hub of physical activity and social recreation. The rich lineup of indoor amenities includes a multi-purpose room, state-of-the-art fitness center, and indoor pool. Outdoors, residents have a sparkling swimming pool and patio, perfect for lounging on beautiful, sunny days. Del Webb Wilmington also provides multiple sports courts including bocce ball, pickleball, and tennis courts. An event lawn is ideal for enjoying a concert or events outdoors. Residents also love scenic strolls along the neighborhood's walking and biking trails as well as enjoy all of the parks and natural space. In addition to these exclusive amenities, homeowners from Del Webb Wilmington also have access to the amenities found in the RiverLights master-planned community. Del Webb will build 547 homes in this active adult development and offers three unique home design collections. Homebuyers can choose from the Passport, Expedition, and Pinnacle series. Home designs in the Passport Series range in size from 1,262 to 1,424 square feet and have two bedrooms, two bathrooms, and an attached two-car garage. These single-family homes feature open floor plans, spacious gathering and dining areas, large laundry rooms, elegant master suites, and private patios. Single-family homes within the Expedition Series ranges in size from 1,656 to 1,961 square feet. These beautiful homes have two bedrooms, two bathrooms, and an attached two or two-and-a-half-car garage. They feature spacious walk-in closets in the master suites, flex space near kitchens, and an optional loft or second-bedroom. Pinnacle Series offers four distinct models that range in size from 2,411 to 2,565 square feet. These single-family homes have two or three bedrooms, two to three bathrooms, and an attached two or two-and-a-half-car garage. They feature open layouts, luxurious master suites, gourmet kitchens, spacious dining and gathering areas, and plenty of storage space. Endless options for recreation and socialization are available to all residents in this 55+ community. Homeowners have an engaging lifestyle with other like-minded adults and share new hobbies. There are classes, clubs, and other programs tailored to the interests and needs of active adults. A full-time onsite activities director is available to help plan and coordinate events, outings, and other social functions that bring members of the community together in a friendly setting. Homebuyers love Del Webb Wilmington's prime location in Coastal North Carolina. 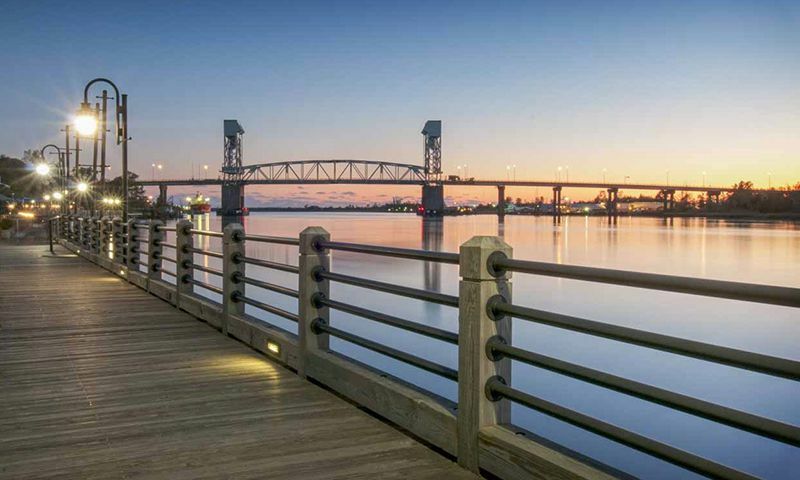 This 55+ community is just ten minutes away from downtown Wilmington where residents have plenty of shopping and dining options as well as easy access to healthcare facilities and entertainment. Major roadways like Routes 421 and 117 are close by for cross-town travel. When traveling farther is necessary, Wilmington International Airport is 25 minutes away. Cape Fear River, Carolina Beach State Park, and Masonboro Island Reserve are nearby for outdoor recreation and water activities. Several parks and golf courses are within short driving distances from the community like Cape Fear Country Club, Echo Farms Golf & Country Club, and Pine Valley Country Club. Del Webb Wilmington has everything active adults could want or need in this beautiful Coastal North Carolina retirement destination. Clubhouse - 15,000 Sq. Ft. There are plenty of activities available in Del Webb Wilmington. Here is a sample of some of the clubs, activities and classes offered here. Home designs in the Passport Series range in size from 1,262 to 1,424 square feet and have two bedrooms, two bathrooms, and an attached two-car garage. These single-family homes feature open floor plans, spacious gathering and dining areas, large laundry rooms, elegant master suites, and private patios. Please Note: Floor plans are not available at this time. Single-family homes within the Expedition Series ranges in size from 1,656 to 1,961 square feet. These beautiful homes have two bedrooms, two bathrooms, and an attached two or two-and-a-half-car garage. They feature spacious walk-in closets in master suites, flex space near kitchens, and optional loft or second-bedroom. Please Note: Floor plans are not available at this time. Pinnacle Series offers four distinct models that range in size from 2,411 to 2,565 square feet. These single-family homes have two or three bedrooms, two to three bathrooms, and an attached two or two-and-a-half-car garage. They feature open layouts, luxurious master suites, gourmet kitchens, spacious dining and gathering areas, and plenty of storage space. Please Note: Floor plans are not available at this time. Del Webb Wilmington is a community of amazing residents who look out for each other, go out of their way to help, and know how to have fun! Living in a community with people your own age, at similar stages of life is incredible. Finding neighbors with common hobbies, interests, and organized clubs and activities is so much more important than I ever realized. This is a fantastic community. 55places.com is not affiliated with the developer(s) or homeowners association of Del Webb Wilmington. The information you submit is distributed to a 55places.com Partner Agent, who is a licensed real estate agent. The information regarding Del Webb Wilmington has not been verified or approved by the developer or homeowners association. Please verify all information prior to purchasing. 55places.com is not responsible for any errors regarding the information displayed on this website.